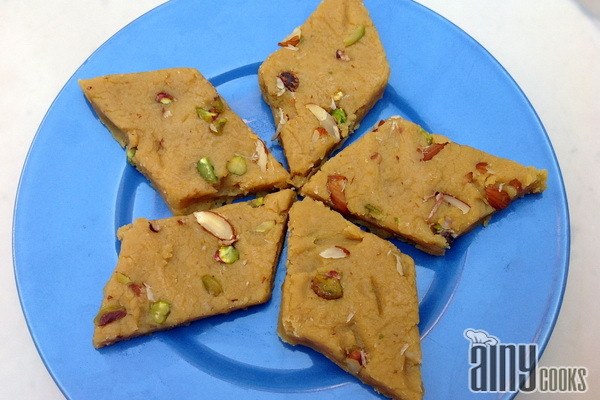 Chane ki dal ka halwa/ gram lentil pudding is scrumptious dessert. In Pakistan this is very famous in all age groups. I remember when i was a small kid ,on 15 Shaban (shab e barat) along with other halwas my mother used to make this one as well. Wash gram lentil and soak it in water for 1 hour. Boil it and drain water. Grind it till paste forms. Now in a pot add ghee/butter and cardamom , let it crackle and add paste of gram lentil. Add sugar also and stir this constantly till ghee start to separate. 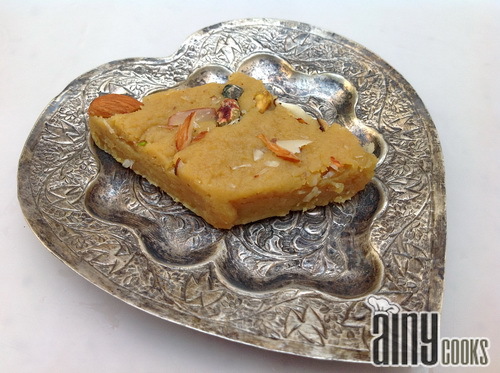 Add khoya or powder milk and stir well. As soon as ghee separates add nuts and spread this mixture on a greased tray. With spatula or flat spoon even the surface an cut shapes of your choice. Let it cool completely and with knife separate them. You can follow this technique too, after boiling lentil grind it and in ghee roast it, in separate pan add ghee and cardamom. Let it crackle and add sugar and 1/2 cup water as soon as sugar melts add lentil and stir constantly. 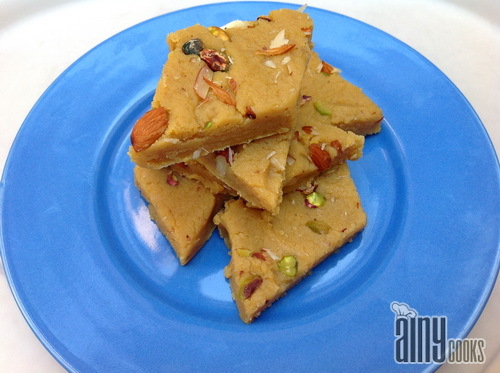 Now stir it till ghee separates, add nuts and spread on tray and cut shapes. wow ainy 🙂 so beautifully made 🙂 yaar please pass me some 😀 i am loving them 😀 wishing to grab some..
Any idea of how much milk we should use to boil lentil or if we use water approximately how many cups. Also 1/2 kg daal is how many cups.also for powder milk cam we use everyday tea whitener . 2 cups is very much enough for 1/2 kg but do not use ant tea whitener. I am using Nedo.